TAMPA, Fla. - SWAT teams swarmed a downtown Tampa hotel early Friday to arrest a suspect in a quadruple killing. A 4-year-old autistic boy believed to be the man's son was found safe, Tampa police said. Police said they took Adam Matos, 28, into custody at the Floridian Hotel, and that multiple charges are pending. The child, Ismael Tristan Santisteban, was with him. 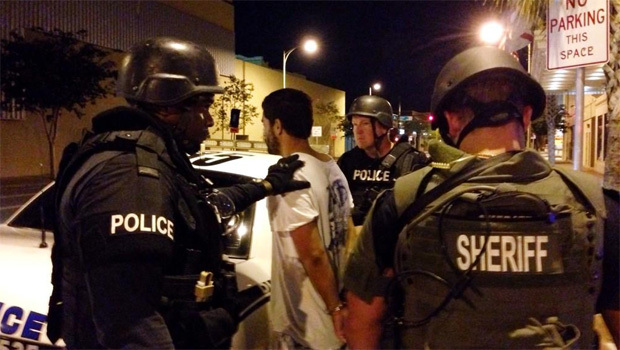 A tip led multiple law enforcement agencies to downtown Tampa. The search for Matos and the boy began Thursday after Sheriff's deputies in nearby Pasco County conducted a welfare check at a Hudson home. The deputies who stopped by the home noticed a bad odor. They walked down the street toward an area where birds were circling and found four bodies piled on top of each other. Matos quickly became a suspect. He had been seen in the area recently and Pasco County Sheriff Chris Nocco said the killings were not a random act. Officials have not released the names of the victims or said how they may be related to the boy and to Matos. Tampa Police Chief Jane Castor said the suspect was found in a room on the 18th floor of the Floridan Hotel in downtown Tampa. Castor said officials used a ruse to get him out of the room, away from the four-year-old boy and into custody. Before making it to the hotel, Castor said Matos was spotted at different bus stops downtown. She said that Matos did not have a bus ticket on him when he was arrested, but investigators believe he may have been inquiring about one.